Temporomandibular disorder, commonly referred to as TMJ, is a somewhat common disorder that can cause a variety of negative symptoms. The temporomandibular joint is the primary joint that connects your jaw to the temporal bone in the skull. Temporomandibular joint disorder (TMJD) occurs when there is a misalignment between your facial muscles and jaw. Oftentimes, patients suffer from the negative symptoms of TMJ disorder, without realizing they have a jaw misalignment. At Gables Perfect Smile, we diagnose and treat TMJ disorder for our patients suffering from facial pain and other negative side effects of TMJD. The best way to tell if you have TMJ disorder is by visiting a dentist. We will be able to perform a series of tests and x-rays to identify any jaw disorders. The temporomandibular joint uses a hinge-like, sliding motion to allow your mouth to open and close effectively. A lot of different factors could be causing your TMJ disorder. The area of your jawbone that interacts with the jaw joint is covered with a cartilage material that is separated by a small disk, which allows your mouth to open and close seamlessly. Oftentimes, TMJ disorder occurs when the disk in your jaw moves out of alignment, the joint’s cartilage is damaged by arthritis, or the joint is damaged by trauma. 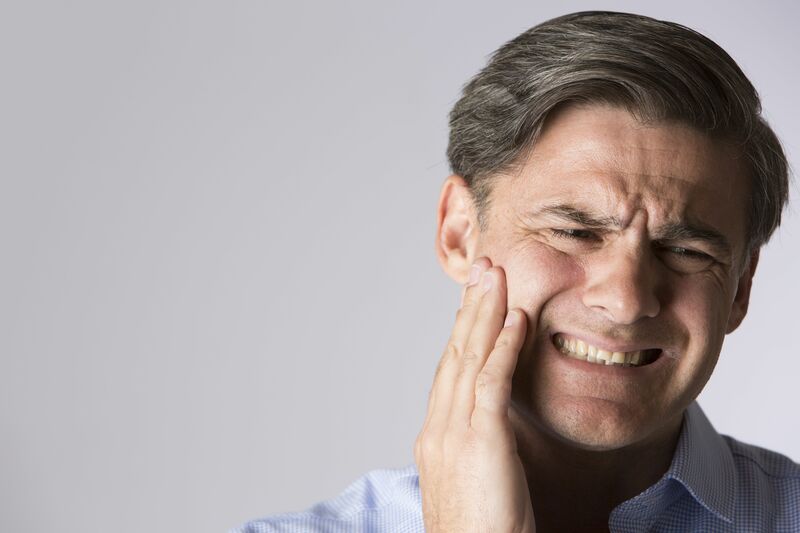 Most patients can help relieve their TMJ disorder symptoms before they become too serious. Beyond seeking treatment at our office, you can try making lifestyle choices. Certain foods and ways of chewing can exacerbate your TMJD, and cause you unnecessary pain. For instance, you can try to avoid food that requires a lot of chewing, in order to give your jaw time to heal and rest. You can help sooth inflammation in your jaw by avoiding any food that requires you to open your mouth too wide and that is large and thick. You should also keep your distance from excessively chewy foods, like chewing gum and caramel apples, as well as hard and crunchy foods, like hard pretzels, hard bread, and raw carrots. When possible, you can try chopping your foods into small, easier to chew pieces. When your TMJ disorder is flaring up, the best foods to eat will be softer and require little to no chewing. Some good foods to consider during a TMJ flare up are yogurt, mashed potatoes, cottage cheese, scrambled eggs, smoothies, fish, beans, and other soft foods. Most patient’s symptoms will subside after two or so weeks on a soft diet. Patients suffering from severe TMJ disorder will need to remain on this diet for longer periods of time. At Gables Perfect Smile, we offer a form of BOTOX, known as Dentox, to help patients suffering from TMJD. Dentox injections help to treat common symptoms from TMJ by alleviating jaw clenching. The primary difference between traditional BOTOX injections and Dentox is that BOTOX works to deactivate facial muscles that cause wrinkles, and Dentox works to relax the jaw muscles, which removes pressure put on the temporomandibular joint from jaw clenching. Consequently, this reduces discomfort from TMJ, as well as prevents harming your teeth, jaw joints, and gums any further. Like BOTOX, Dentox is administered with minimally invasive injections. We also might use an electronic muscle locating device to help determine the best muscles to be treated. During your initial consultation, we will assess your dental and physical health to see if you’re a healthy candidate for Dentox. Want to learn more about Dentox as a TMJ treatment at our Miami dental office? Give us a call today at 305-901-0700.